The above maps show Esmeralda Road in 1918 and after WW2 in 1948. The Langman's House at number 39 is coloured blue on the 1918 map. The 1948 map shows this section of houses have disappeared. 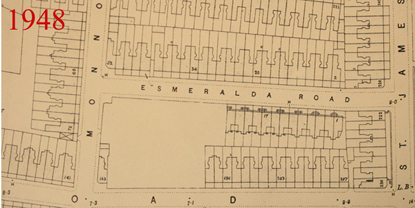 The map below dates from 1945 and shows the bomb damage during WW 2 to Esmeralda Road and surrounding area. Esmeralda Road is in the centre of the map. The bomb damage is colour coded. The mauve/dark blue indicates total destruction of property whereas the red /orange indicates repairable damage. 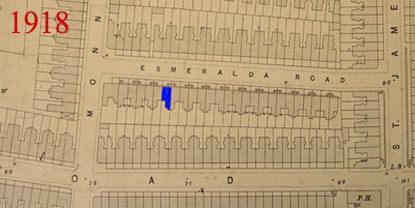 Today Esmerald Road still exists but has been completely rebuilt. ........................................................................ Home | George's Story 3 ..